Skin irritation from incontinence is also referred to as Incontinence-Associate Dermatitis which is caused by the prolonged exposure to the bacteria in urine or stool and can result in painful symptoms such as burning or itching. Tender, dry skin can break down rapidly, particularly when moisture is present, and can be very challenging. Your first and best defense is to use highly absorbent products that are made for bladder control. These products are made to absorb urine and work to quickly pull liquid away from your skin. Next, be sure to change the product frequently and definitely after each significant void. When cleaning the area, use mild soap or the Bedside Care Perineal Wash, rinse well and blot the skin dry. Try not to rub! Instead, blot the moisture away and be sure the area is thoroughly dry which is critical to keeping skin healthy! Last, if skin irritation persists, you can apply an ointment or cream such as Calmoseptine Ointment or Baza Antifungal Cream that is specifically designed to be a barrier against moisture. 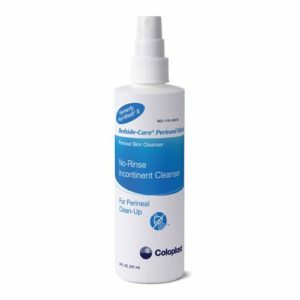 Bedside Care Perineal Wash™ is a no-rinse incontinence cleanser with anti-odor ingredients and no dyes or fragrances. 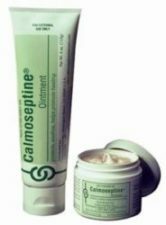 Calmoseptine® Ointment is a multi-purpose moisture barrier ointment that protects, soothes and helps promote healing for skin irritations from bladder and bowel incontinence, minor burns, scrapes, diaper rash and moisture. Baza® Antifungal Cream provides a protective barrier that inhibits the growth and reproduction of fungal cells. Absorbent products come in many different varieties, so anyone can live actively and confidently. 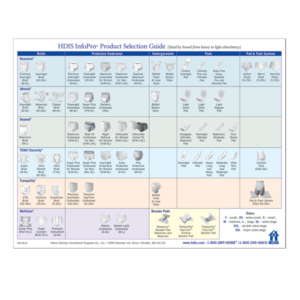 If you are thinking about the needs of your patients, or those of your loved one, turn to the HDIS InfoPro Product Selection Guide. This illustrated guide describes each category and helps you understand how products are organized. Visit our store to order your free supply today. Or call HDIS at 1-800-2MY-HOME® (1-800-269-4663).